I’d love to hear from you! Here are some of the ways you can get in touch with me. You can leave a comment on any post. I check comments regularly and love hearing about what you’ve made. Do you have questions about a particular recipe? Did your grandmother make it differently? Tell me! It is such fun to learn from this community of bakers. Feel free to request a recipe for a special occasion or maybe there is something your family made years ago and you can’t quite recreate it. Reach out and get in touch. Stay up to date on all new posts by subscribing to my email list. You can opt in on my homepage. 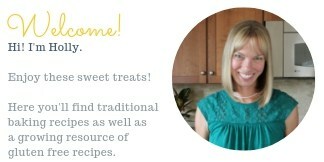 I’d love to share ideas and recipes with you each week. Do you need my mailing address? Email me please and let me know your request. If you are a company interested in working with A Baker’s House, please email me with details about your campaign. I love working with brands that I support and believe in. Please get in touch with me at [email protected] If we are a good fit then I will send you my media kit so that you can learn more about the value I bring to partnerships. If you would like recommendations or samples of my work with other brands please let me know. Thanks so much for stopping by A Baker’s House. I value each reader and sincerely thank you for your time. It is such a joy to be able to bake and share with you!